Adventures in Babysitting | KARIBU! A few months ago our friends here approached us about babysitting their 4 children for 10 days while they went away on business. We love their family and their kids a so much fun so we did not hesitate to say yes. So off went mom and dad while Austin and I moved in. Steve, Dyan and their amazing kiddos! Their children, Tesfaye (15), Caleb (12), Zoe (12), Epiphany (9), are a bit older so there were no diapers to change and for the most part they can take care of themselves which makes our job a lot easier. They also have Oppas, the driver, who can run and get groceries and other such things while we are at work, Jenny the cook who makes delicious food and makes it so that after a long day I do not have to worry about anything except setting the table, Mama Mary and Mama Jane who do all of the cleaning and laundry, Babu who runs the grounds and feeds the animals, and guards to keep us safe day and night. All of these wonderful people together, made our time there easy and enjoyable. The other part of the gig that is nice is that we are right across the street from the Indian Ocean. The road that lines the ocean is much more peaceful than the other roads around in Dar es Salaam and is very nice for getting a good run in. We had many afternoons on the beach and even got a good Beach BBQ in. At the Larmey house there is never a dull moment and this time was not an exception. The first morning we were there Austin and Caleb found a rat in the kitchen. This is not a rare thing to see here, but the next part of the story is what makes it amazing. Austin and Caleb, thinking quickly grabbed Chuy the cat, and placed her right where they had cornered the rat. Chuy quickly figured out what was going on and caught the rat. She then did her little cat thing and played with it and killed it to feed it to her 5 baby kittens. Austin tried to get it on video but it did not safe. Bummer. Ginger the dog then tried to steal the rat from Chuy, but Chuy was not having it so she slashed Ginger in the eye and Ginger was bleeding. All of this happened before 7am that morning which I was impressed by. Throughout the 1o days the kids went to friends for sleepovers, we swam in the ocean, watched the Shrek movies, McGyver, and Veggie Tales, we played instruments, studied for tests, packed lots of lunches and had friends over to sleepover at our house too. On the second to last night we had a few older boys over to spend the night and stayed up quite late. Eventually we got to bed but it was late. Once we were completely asleep and in the REM cycle of sleep we were awakened by the loudest and scariest sound I have ever heard! It sounded as if every dish in the kitchen had shattered to pieces, or the glass chandelier had fallen from the ceiling. With crime being something that happens more normally here we were scared to death. If it were someone breaking in they were for sure already in and had already done the damage. With no bat to protect us, feeling helpless Austin got the courage to go outside our room and see what had happened. As we entered the hallway and kitchen we found dishes shattered all over the floor. Upon further inspection we figured out that the shelf had completely given way and the bottom a half of it collapsed and took all that was in it with it. These shelves were not built that long ago and they were not built enough support, or the right support. The worst part was that it was some of Dyan’s favorite dishes, some of which were from Ethiopia. Why it decided to fall in the middle of the night is beyond me, but I am thankful that it was not when the kids were sitting and eating breakfast at the table right by it or when one of the house workers was walking by. We are very grateful that no one was hurt and that it was not a robbery. Austin was pretty anxious the few nights afterward but he seems to be back to normal now. For once I was the calmer one in the situation. After that insane, and unpredictable event we prayed that we would not have any others like it. 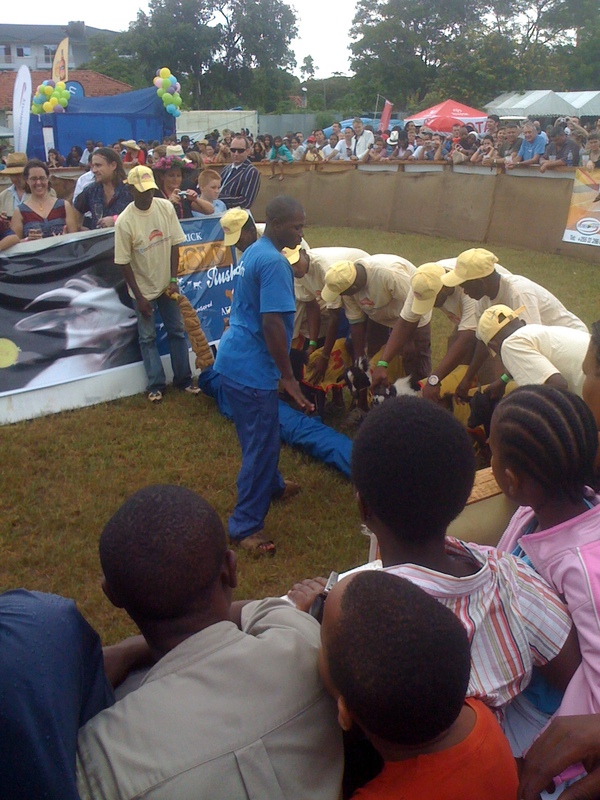 On our final full day with the kids we took them to the 9th annual goat races (our second time for this event.) We ate food, saw lots of goats, helped raise some money for charities, and saw lots of friends. Afterward we took them to get a milkshake at the local chain restaurant Spur. It was a long day with lots of traffic and lots of rain but it was a lot of fun too. 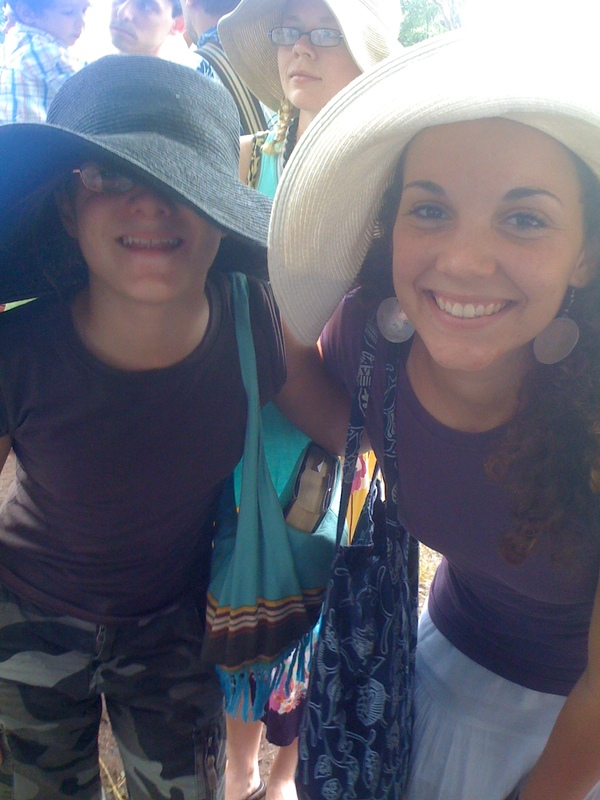 Zoe and I wearing our fancy hats to the races. 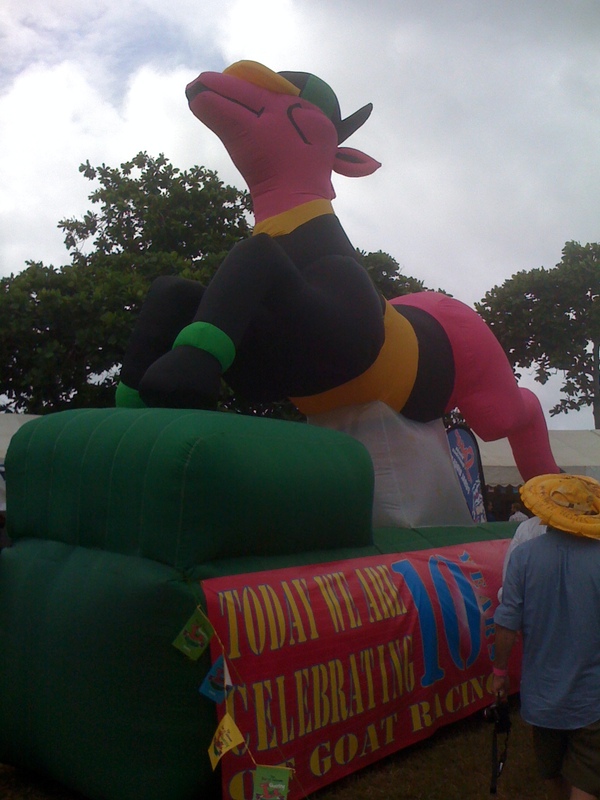 The big blow up goat that welcomes you as you enter. Getting the goats ready to race. 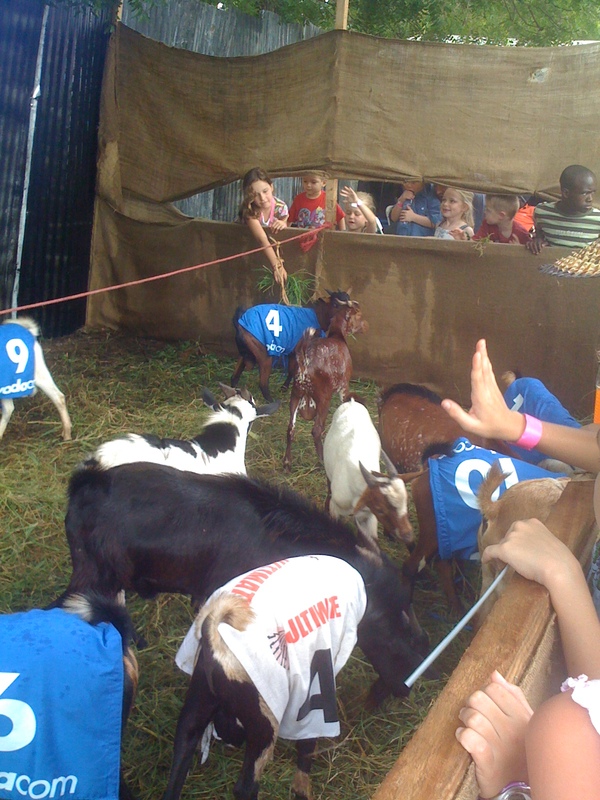 Kids feeding the goats as they waited for their turn to race. We love the Larmey’s and had a wonderful time with all 4 of the kids. We are ready for more babysitting adventures in the future but hope that next time the cabinets will stay put!